PuzzleMad: He's so good that he can weave wood! He's so good that he can weave wood! Christmas this year was very quiet for me and Mrs S! We had a lazy day - after a small present opening ceremony which consisted only of 2 puzzles for me (Stifled Sob! Sniff!) Although, I did get some booze and goodies to eat too. We settled down to watch some TV and for me to play with my new and my old toys! I was very good and didn't touch anything that jingled and settled down with a new piece of wooden beauty from Brian Menold of Wood Wonders - this one I had been waiting for a few weeks. 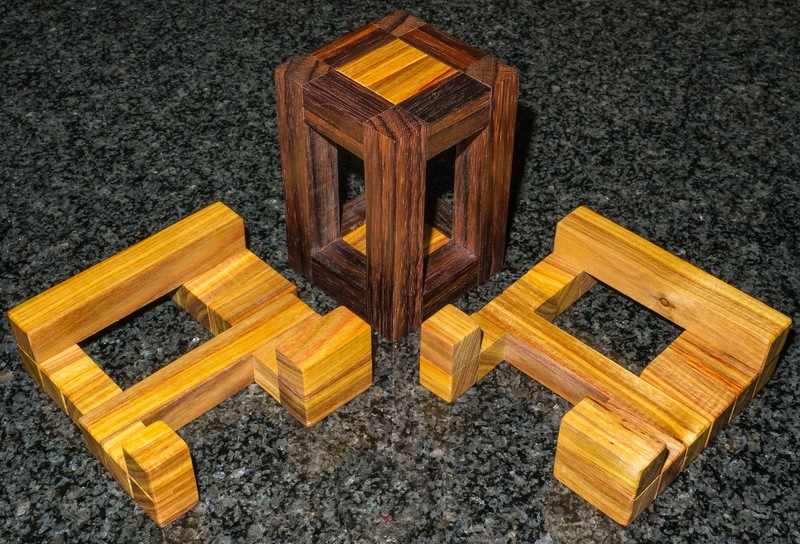 Brian has developed a sneaky habit of posting on his webpage about puzzles he plans to make and then allowing pre-orders! So a few weeks ago I told Mrs S that her Xmas present to me had just been announced. She was very good - she feigned interest and grunted her assent. The puzzle arrived just before Xmas and was kept aside until the big day! 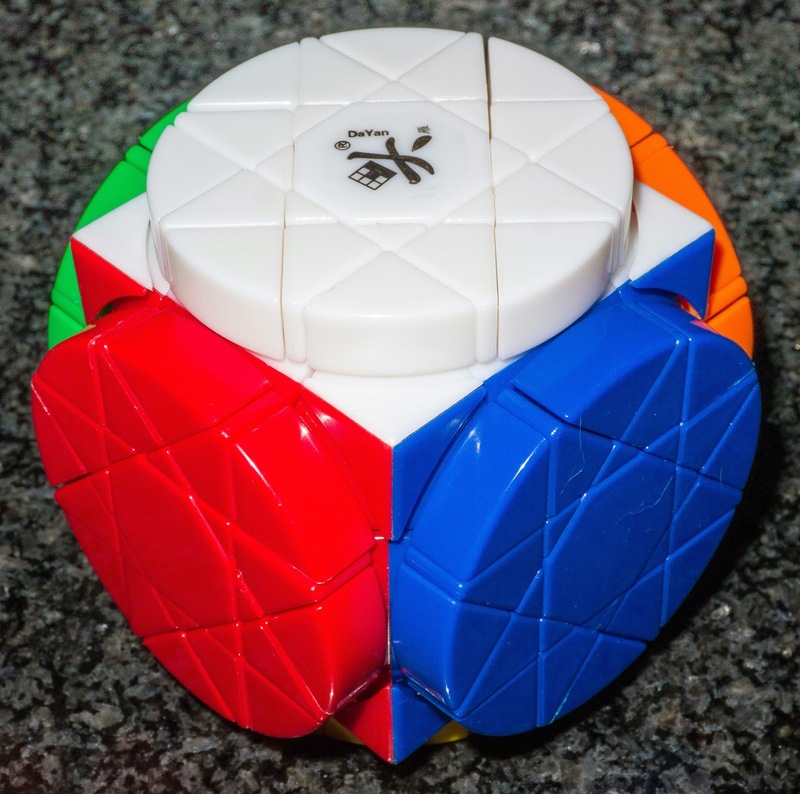 I (and she) thought that was going to be it until Calvin from the HKNowstore announced the arrival of something new from Dayan - this is the Wheel of Wisdom twisty puzzle - it looked suitably horrific and so I had to have it! I'm a sucker for punishment! The L in cage was designed by Yavuz Demirhan and is a really clever design. On unwrapping it, you can only gasp at the shear beauty of Brian's workmanship - the precision is wonderful and the woods (highly grained Canarywood and East Indian Rosewood) are beautifully polished and waxed. It is also a pretty big burr at 3" on each axis. When solving, the initial thought, of course, is "why is it called L in cage?" 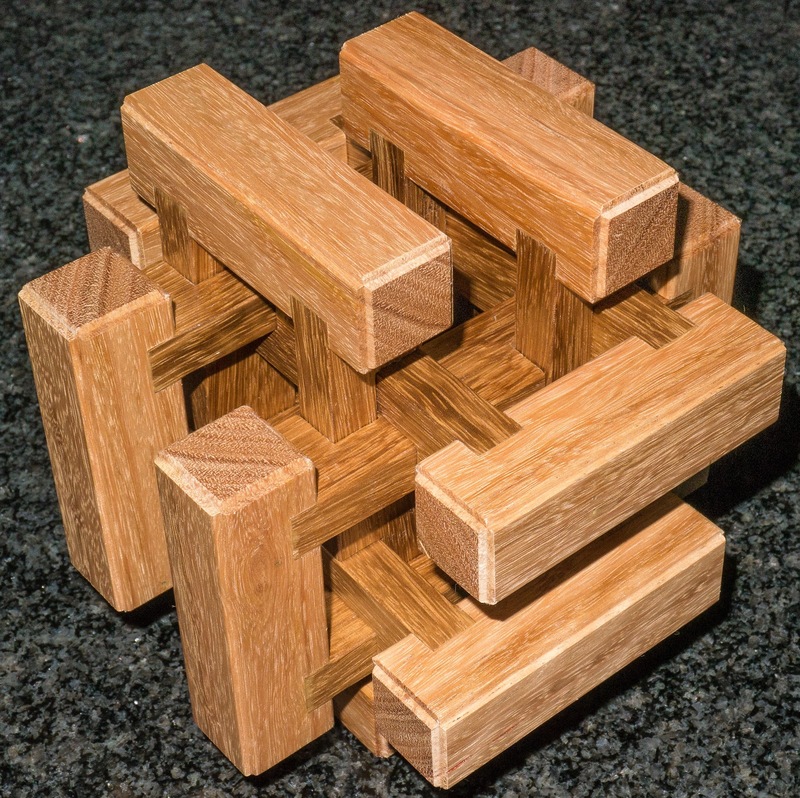 This immediately comes clear with the very first movements when it becomes apparent that each of those protruding blocks of 8 sticks consists of 2 L shapes. There is a lot of movement possible but they don't come apart easily because they are all highly interlocked. It is is not an overly difficult puzzle at level 10.2.2 but for a Christmas day puzzling warm up it is just perfect - I think it probably took me about 30 minutes and has become one of the puzzles that looks beautiful enough to be allowed to stay on show outside my puzzle cave! Thank heavens! I am running low on space again and am going to have to rearrange things again!! Look at the left top shelf! 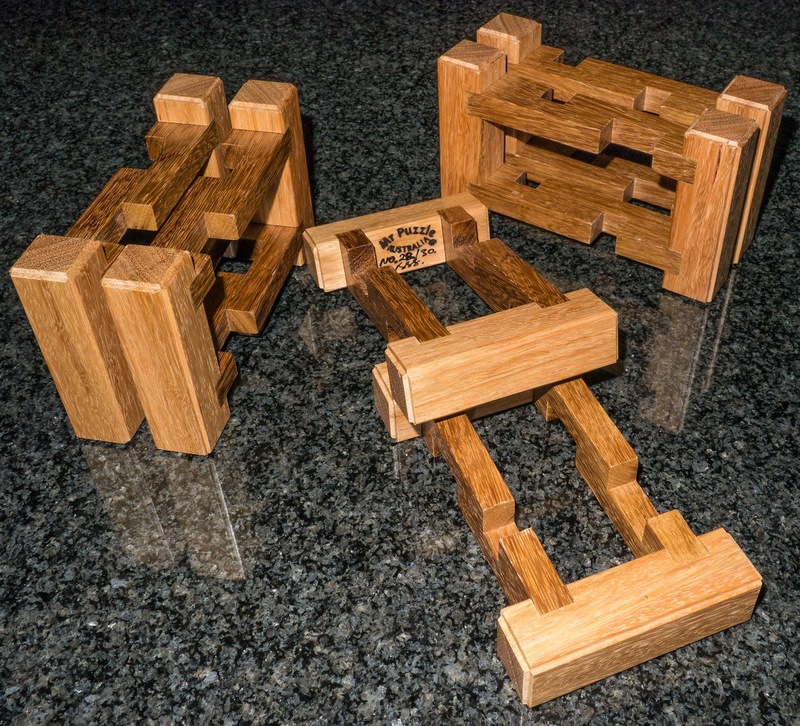 Having done my little warmup, taken my photos and explored whether it was assemble-able in any other way, I decided to try my hand at the 4th puzzle from the set of limited edition burrs from Brian Young - aka MrPuzzle. 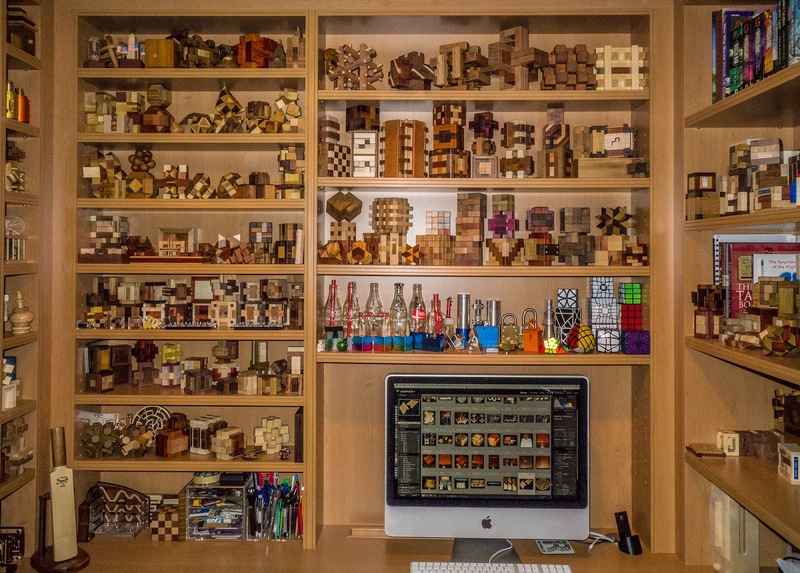 These very special puzzles take pride of place in my study - they are on the top shelf along with a few others of his marvellous creations! You will also notice that the fantastic Opening Bat is on the desk itself at the left hand side! I actually need to clamber up on my desk and risk my neck to get to the burrs - this prevents me from just going through the whole lot one after another - I am trying to make them last until the next limited edition is released! 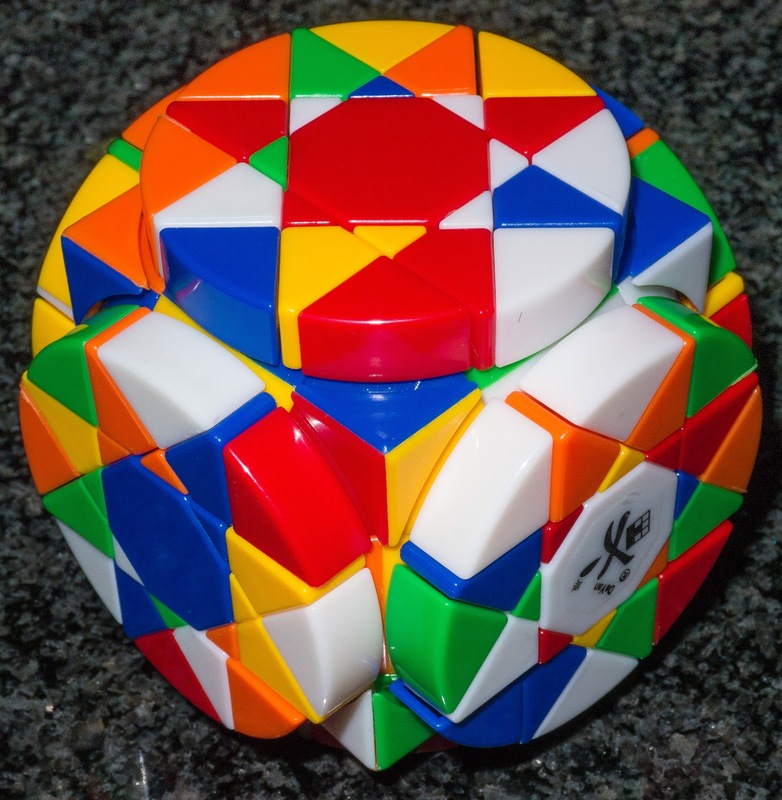 "this is certainly one very difficult puzzle." "It is constructed from 6 pieces, each of which consists of two ‘S’ shaped pieces joined at the ends. Not all the ‘S’ shapes are the same and not all of them run in the same direction. With check-outs (notches) on different sides, all 6 pieces need to be interwoven together at the same time to assemble the puzzle. It is by no measure interlocked like a standard burr." The final shape is symmetrical, but each piece is slightly offset to the opposing piece which makes it harder to focus on and visualise the final shape. With this description blinding me I carefully clambered off my desk and brought it into the living room where Xmas TV was playing. To be honest, I have absolutely no idea what I watched on TV - I don't think I actually saw very much of it! The first thing that struck me was that the pieces don't move the same way as other burrs - there is no way for the pieces to slide lengthways at all. This is because the notches cut into the sides are all linked. A little exploring reveals that one or two initial sideways movement are required first to disengage some of the notches and then the lengthways movements are now also possible. There are a lot of possibilities to move this about and because of the sheer complexity of the construction it is terribly hard to form a plan of what I want to do and my usual 'try lots of things and keep back tracking every few moves' approach doesn't work. Cat on a lap makes puzzling awkward! Suddenly I saw that some of the notches are a full 2 voxels in width and then I realised that the 2 voxel thickness of the burr pieces meant that they needed to somehow be fed through these larger notches. I very quickly end up with pieces all over the place but still locked together in a sort of wooden tangle! This is despite the whole thing now looking very rickety indeed! After a while it becomes possible to achieve a rotational move or two and it is quite hard to prevent them from happening spontaneously! Whilst lifting it up to look at the bottom, it suddenly spun and a piece rotated out onto the cat on my lap. He was most displeased! At this point the rest of the puzzle comes apart really quite easily and you can finally see how the puzzle parts are genuinely woven together! Now part of me was slightly annoyed because I knew I had found a shortcut using a rotation and had absolutely no clue how to put it back together again. But my annoyance quickly vanished as it was time to play with Burrtools again! I just adore this wonderful piece of software (thank you so much Andreas!) 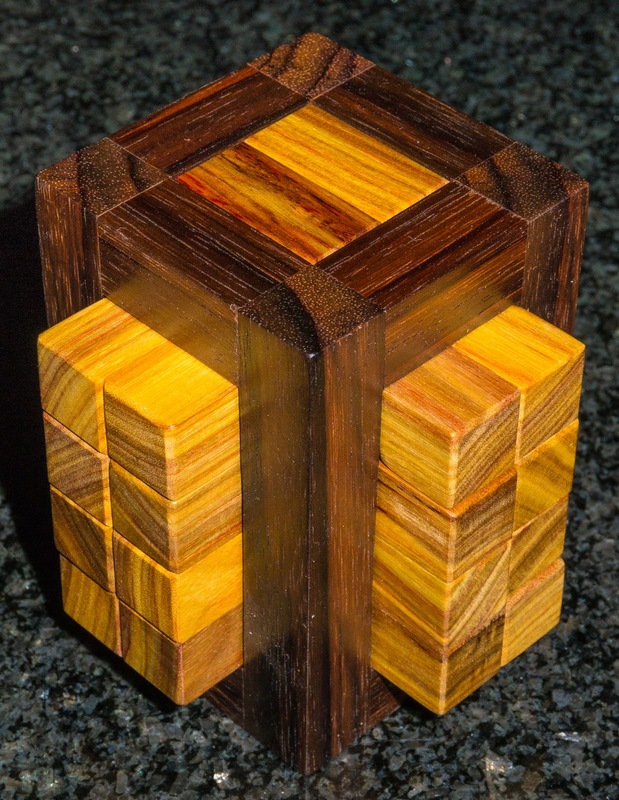 and all my burr puzzles end up modeled in here - it is just a part of the fun for me! This one was particularly hard to model but after an hour or so of fiddling about I had my solution and using at least 2 pairs of hands and my toes managed to get it reassembled! If anyone would like a copy of the burrtools file then just contact me! It's just as beautiful in pieces! Now I know that my friend (and soon to be adopted father!) Laurie asks his long-suffering wife to take all his burrs apart before he tries them and he always starts with a pile of pieces! I really don't know how he does it and wonder whether he also got this series and managed the same feat with this one? I have now managed to disassemble the woven burr 4 times using the correct sequence and each time was as difficult as the first! It is just sooo hard to get my head around the way these pieces move. I have also each time attempted to reassemble from memory and by deduction but haven't even got close to managing it! I will keep trying and hopefully will succeed soon. Obviously when another shiny toy arrives, it will be time to move over to something else! I have the attention span of a butterfly! It's not just a "stack of sticks"